Please note that the content of this book primarily consists of articles available from Wikipedia or other free sources online. 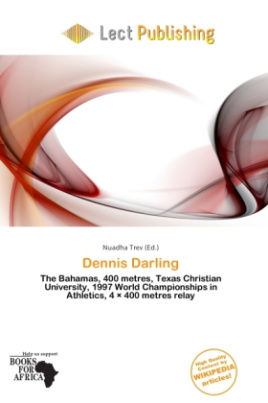 Dennis Darling (born May 6, 1975 in Nassau, Bahamas) is a Bahamian athlete who specializes in the 400 metres. He is currently track and field Assistant Coach at Texas Christian University. Darling competed in 400 metres at the 1997 World Championships, where he was knocked out in the heats with 47.96 seconds. By 2003, his best season, he had lowered his personal best by over two seconds and achieved 45.83 seconds.